St Marcel, in the environs of Pezenas, was once the home of a wine merchant. Domaine à l’Aise built in 1850 has been converted into a small Chambre et Table D’Hôte which exudes a French atmosphere. Domaine a l’Aise is not a hotel, but our home and we want it to be your home away from home. 15 years ago the previous owners began the conversion from a wine domaine into the Chambre D’Hôte with five immaculate and cosy bedrooms. There is a beautiful garden, terrace and lounge for the guests exclusive use. There is parking with CCTV. The property also boast a swimming pool and a petang court. We also have several bikes on site for guests use. We have plenty of sun loungers and chairs for our guests to use in the area around the swimming pool. There are other separate seating areas in the garden. We have a table tennis table in the garden for guests use and a badminton facilities. We are able to advise our guests on the many and varied interesting places to visit in the area. We have a vast variety of marvellous walks in this region. 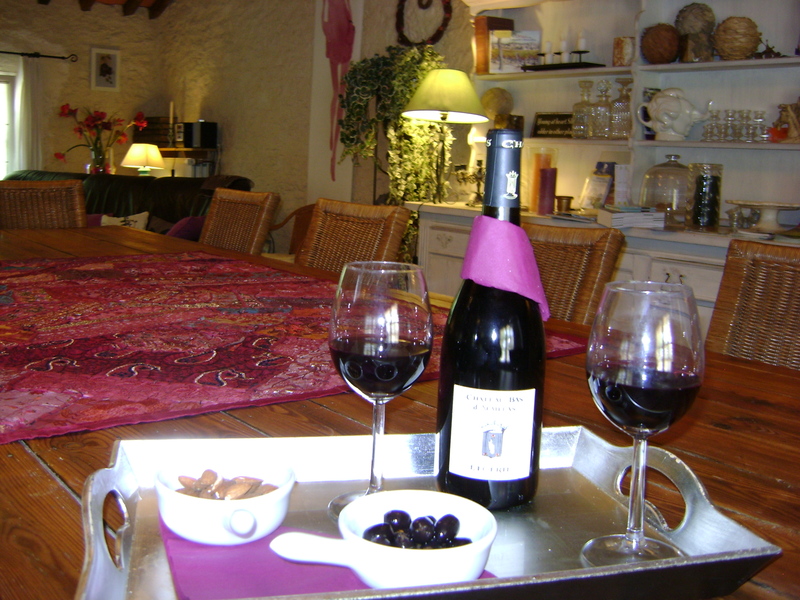 However, we do, of course, invite you just to relax ‘a l’Aise’ if you so wish! Domaine a l’Aise is well known for its family rustic style dining, honesty bar and the chance to experience various regional wines, along with its relaxed and easy atmosphere. A three course meal is available up to 6 evenings per week using locally sourced ingredients. We do love to enjoy a relaxed BBQ night with our guest once per week. Michael and Karen spent five years searching for their perfect new home in the South of France. Domaine a l’Aise has guests returning year after year to continue exploring all that the Herault and Languedoc Rousillion have to offer. Ideally situated for the beaches at Meze and beyond, the amazing medieval towns of Pezenas and Carcassone, the Canal du Midi, many wine domains and so much more, the Domaine a l’Aise is perched on a small hill, surrounded by vineyards and olive groves, overlooking the beautiful valley of Plaissan. Only a 20 minute stroll away from the centre of Saint-Pargoire, Karen and Michael offer their guests the ideal chance of being transported back to the relaxed life styles of the vignerons, where a day begins with a breakfast on the terrace and finishes with a glass of wine at sunset, nothing has changed. Wines are source locally, including organically some that are organically produced. We should be delighted to arrange for you to visit one of the domaines we use. with a villager who may be filling his daily ewer! Locally there are plenty of archaeologically interesting sites to visit. It is the perfect place to unwind and relax. Should you also be looking for your dream home , when you visit you will understand why the Domaine a l’Aise chose us!